To fit Husaberg FE501 2013-2014 Apico Factory Racing clutch kits offer OEM durability achieved by manufacturing a complete kit where all components work effortlessly together. Apico steel clutch plates are much harder wearing compared to other aluminium clutch plates on the market. To fit Husaberg FE570 2009-2012 Apico Factory Racing clutch kits offer OEM durability achieved by manufacturing a complete kit where all components work effortlessly together. Apico steel clutch plates are much harder wearing compared to other aluminium clutch plates on the market. Please note: The image used is an example of what the clutch kit contains. The kit you will receive contains 9 x friction plates, 8 x steel plates and 4 clutch springs. 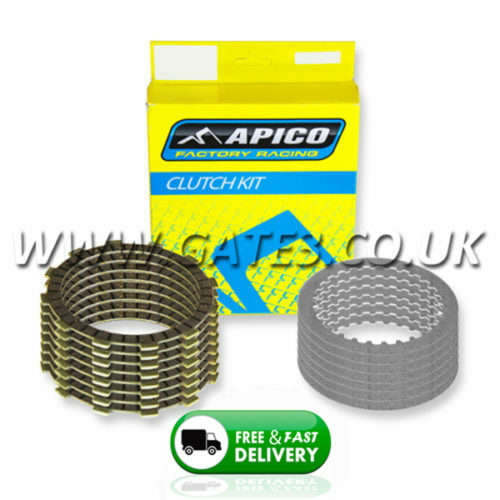 Where applicable, Apico clutch kits remove the original judder springs which can be problematic and cause premature clutch wear.